The team at Aspree welcome corporate guests, teams, work-groups, contractors, truck drivers and families to our warm and friendly motel. Our location is a 10-minute walk from the heart of Palmerston North and many great restaurants and bars. We have 2 supermarkets, Irish pub, Subway, Dominoes, fast food outlets and a Sports Bar all within a 5-minute walk from our motel. We also have an on site restaurant. Aspree Motor Inn has loads of parking. We are happy to report all out upgrades are now complete, all 41 units have been upgraded. 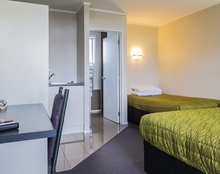 We have a great selection of accommodation options at Aspree Motor Inn, from our studio suites which are specifically designed for corporates and couples, to our Twin Studio Suites, which have the extra bed. We also have the One Bedroom Executive Suites which provide extra space for couples. Our 3 Bedroom family unit is ideal for groups and sports teams and sleeps up to 8 persons. All units have been recently refurbished. Free unlimited WiFi access available throughout the 40 units. 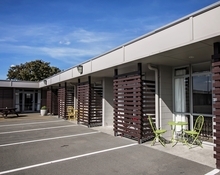 The Aspree Motor Inn in Palmerston North has ample parking and a bbq for your use. All our rooms have 32 inch tvs with freeview and sky. We pride ourselves on equipping the rooms with what you need so all our units have the basic necesities of a toaster, tea and coffee making facilities and a microwave. Our corporate units all have cooking hobbs or electric frypans and our larger units have full kitchen facilities, also available onsite is a separate full equipped kitchen for sports teams or large groups. We also have WiFi available. 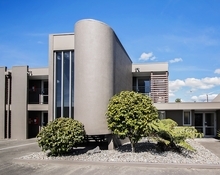 Aspree Motor Inn is located at 700 Main Street, Palmerston North, New Zealand. Aspree Motor Inn is your home away from home and the team pride themselves on welcoming you all with a smile and helpful service you will remember. We welcome all enquiries large or small and can do a written quote for you if required. Just give us a call or email and we will do the rest for you.